India has been shaken by a spate of mob killings sparked by a hoax about child kidnappers spread on WhatsApp. In just two months, 20 people have been murdered in such attacks. Officials and social media platforms have so far been powerless to stop the violence. But who is to blame? And why is a rumour turning people to violence? An online hoax emerged more than a year ago in eastern India claiming strangers were sedating and abducting children. Six men falsely accused of snatching kids off the streets were killed by mobs in Jharkhand state, police said. In February this year, the rumours resurfaced nearly a thousand miles away in western India. By May, it had reached the country's southern states, often accompanied by a grainy video purporting to show men on motorbikes stealing kids. This falsehood spread like wildfire via WhatsApp, which boasts 200 million users in India who send a billion messages a day. Later, a grisly video claiming to show Indian children killed by organ-harvesting gangs went viral. The macabre images were Syrian infants killed in a gas attack five years ago. Translated into regional languages, the rumour triggered violence across India, particularly in rural areas where distrust of outsiders is entrenched and digital literacy is poor. By early July, at least twenty people had been killed in the previous two months. Among the victims were homeless people, two picnic goers and an elderly woman handing out chocolates to children. India's police rounded up suspects and formed patrols, driving village to village to quash the rumours. In some areas, travelling musicians sung about the scourge of fake news. Authorities in some states shut down internet access in a desperate bid to stop the hoax from spreading. But the awareness campaigns had limited effect. In one instance, an official "rumour buster" was himself beaten to death. Anger turned to WhatsApp, blamed by authorities for spreading "irresponsible and explosive messages". WhatsApp said it was "horrified" by the violence and assured Indian authorities it was taking action. 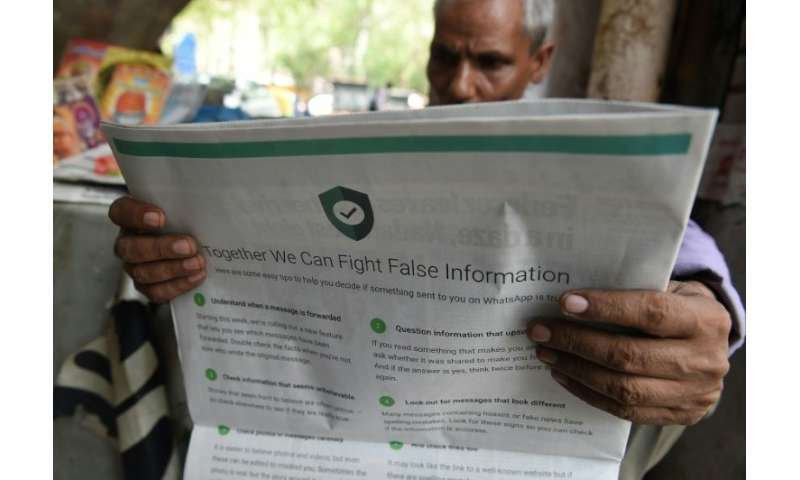 The Facebook-owned company said it was working with Indian researchers to better understand the problem and had introduced changes which it said would reduce the spread of such messages. But some pointed out that WhatsApp as a medium was not to blame, and urged the authorities to tackle the violence. India is no stranger to mob violence, with well-documented cases of crowds turning on victims for every manner of transgression, real or imagined. In recent years, for example, there has been a sharp escalation in "cow vigilantism"—Hindu extremists murdering Muslims and thrashing low-caste Dalits accused of killing cows or eating beef. Many of the victims in other vigilante killings, such as those over child kidnapping rumours, are targeted because they are outsiders. India is fertile ground for fake news to take hold and spread. It has a billion-plus mobile phone users—more than any other country on earth—and close to half a billion people with internet access, most via their smartphones. Cheap handsets and data plans are bringing more Indians online but many are first-time internet users unskilled in discerning fact from fiction. Indian police say there is no substance to the child kidnapping rumours, but the viral videos may not appear outlandish to some. More than 120,000 children were abducted or went missing in 2016, according to the most recent Indian government figures. There is no data available on the number of children who were found. Please don't jup on me to hard, but how do we know this whole article isn't FAKE NEWS? ... how do we know this whole article isn't FAKE NEWS? xponen -- WOW, that sounds good but it puts MOST of CNC news about President Trump on the fake news list. Please don't jump on me to hard, but how do we know this whole article isn't FAKE NEWS? Your probably right, I've never heard of it, with over a billion people WhatsApping this fake news you would think that it would have filtered down to a handful more and to cap it all it was fake news all along and now were discussing a story about a story that a billion people are furtively WhatsApping and were the only handful of people who have never heard of it. Are we telling porkies, or are we faking fake news to produce a faked fake news story, you couldn't make this up? Personally I don't think anyone can tell the difference. A few examples of past fake news. The list goes on and on. We believe what is reported in the news NOT the facts in front of our faces. @rderkis , still I wasn't wrong, a Trump supporter will probably (subconsciously) also obey those "fake news checklist" as well but label the media bashing Trump as fake news. But why? we knew certain media is neutral and they simply report news but why did the "checklist" fail to detect Fake-news when evaluated by a Trump supporter? I don't know why but I'm guessing the media itself can be a good liar and everybody could fall to a lie & scam. Nobody are immune to lies & scam until after you learn about it; how its done, what string did it pull, what goes underneath it. If CNN reported "President Trump is 4 feet tall". A lot of people would actually believe it, in spite of what they see when watching him live on tha same news channel. I am a life long democrat but when the truth is staring me in the face, I can not believe the lies. Look for the number of adjectives and fuzzy qualifiers (great, bad, sad, some, many, ... ). If these outweigh actual factual statements that can be double checked you're dealing with fake news. The above article makes loads of checkable statements, which indicates it is not fake news.